Within this story, the author hopes readers can see the mistakes from history while learning from them. 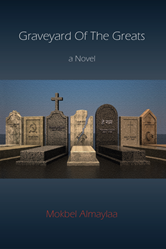 Within the pages of Mokbel Almaylaa’s new book, Graveyard of the Greats ($27.49, paperback, 9781545646335, $45.49, hardcover, 9781545646342), readers will find a novel consisting of a combination of fiction, history, and politics. It puts imagination into play of what was and what could have been. Graveyard of the Greats will help readers further understand the political game while also understanding of the negative effects of wrong politics. Mokbel Almaylaa was born in Lebanon and studied philosophy and has a Master’s degree. His passion is writing and reading. He has previously written Arabic novels and newspaper articles. Xulon Press, a division of Salem Media Group, is the world’s largest Christian self-publisher, with more than 12,000 titles published to date. Graveyard of the Greats is available online through xulonpress.com/bookstore, amazon.com, and barnesandnoble.com.